At A1 Medical Supplies, we pride ourselves on giving our customers access to the highest quality mobility aids and medical products on the market today at the lowest possible prices. Whether you need a lift chair for the family room, a stair lift for accessing your second floor, or a vertical platform lift for your back porch, we offer unsurpassed quality at unbeatable price points. 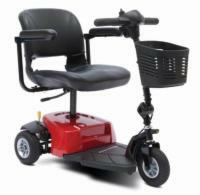 You'll also find rock-bottom pricing and special offers on mobility aids such as electric scooters and power wheelchairs. If you find a lower advertised price than ours on any product you purchased from A1 Medical Supplies, let us know and we'll refund 150% of the difference between what you paid and what that competitor is offering. You can buy from A1 Medical Supplies with the confidence that no retailer can beat our price point, because you can take advantage of our Low Price Guarantee up to 30 days after you buy from us! Please note that the product must be an exact match to our product and their price must include the same items and/or options as ours do.